THROUGH the most trying times in his life, 49-year-old Elia Tinaviti of Navunisole Village in Tailevu, never gave up hope in farming. Navunisole is about five minutes from Korovou Town in Tailevu and is part of the Tikina of Namalata. The village has about 50 houses. The children either attend school in Korovou or the district school at Namalata. Since his young days, Mr Tinaviti has been a passionate believer in achievements. Never did he give up on his studies, even though he admitted he was an average student. "I was never top of my class but that did not stop me from shining in my woodwork lessons," he smiled. After leaving school, Mr Tinaviti joined older youths who were into carpentry and building houses for new families moving in. "I decided to put my skills to use and at the same time I learnt more about carpentry," he said. After a few years, Mr Tinaviti started a family. "I was farming as well but always on a subsistence level. I knew that the time had come for me to move a step up and enter the world of farming as a business," said Mr Tinaviti said. "I walk to my farm at about 5am when the sun is still trying to peep over the clouds and this usually takes an hour." Mr Tinaviti started planting yaqona commercially as he saw other farmers in the village doing the same. "Yaqona farming is quite a task and then I thought to myself that since it takes two to three years to mature, I should move into other crops for short term returns," he said. 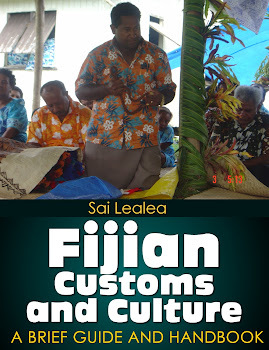 Mr Tinaviti decided to expand his dalo farm from subsistence to semi-commercial level. "I began selling at the roadside in Korovou Town. It went well which is why I started expanding my dalo farm one day at a time." Mr Tinaviti realised that not only was dalo farming raking in cash, but it only took nine months for the crop to mature. At the same time, the thought of commercial farming kept crossing his mind. He grew from strength to strength in the first few years operating semi-commercially. With his earnings, he put his five children through school. Mr Tinaviti never regretted his decision to enter the dalo business. He knew it was time he shared his good fortune with his fellow villagers. "All that was left for me was to try farming dalo commercially - I knew I had to step up my production level. "I was determined - the more I thought about it, the more appealing the idea became." That was when Elia gathered a group of farmers to start a farming group. "It was formed with the aim of exporting our dalo. In order to do this, there would have to be a concerted effort from all involved. The group was formed in 2009 with the Agriculture Department providing advice and technical components of farming for business. Senior Agriculture Assistant Nimilote Waqabaca said they gave their support to the group. Now operating as the Navunisole Dalo Co-operative, 32 members, whose ages range from 20-60 years, have been planting in a bid to increase production for export. The group still practices the traditional way of planting - the 'solesolevaki' method - in which the farmers all help out on a person's farm and keep rotating till every farm in the group or community is on par with the rest. "We were reminded in our meetings we must not wait for help to come, but we should help ourselves first," Mr Tinaviti said. The group worked tirelessly and breathed a sigh of relief when word came that their project proposal had been approved by the Government. The group was fortunate to be recipients of government assistance through its Rural and Outer Island Program. "I guess after working hard, our prayers were answered and help came in the form of dalo suckers, chemicals, knapsack sprayers and fertiliser all worth $38,000," Mr Tinaviti said. Dalo suckers were transported and distributed by November last year and the group wasted no time in planting. Mr Tinaviti says enthusiasm has grown stronger since the group secured the Agricultural Marketing Authority (AMA) of Fiji as its main market. "AMA officials will come to our farms to buy our dalo and the current prices are satisfactory," he said. AMA is buying their Maleka Dina variety at 90 cents a kilogram and Tausala variety at $1.60/kg. The proud farmer says he has even sent two of his children abroad to visit relatives through the money he earned from the farm. "If we put our hearts and minds into whatever we do, the results will surprise us and my farm has brought so many miracles to my family," Mr Tinaviti said. He said the group has been doing well and were anticipating a good harvest as well come their next harvesting period. "What makes it easier is that we've been planting our dalo in phases. This ensures continuity of supply," Mr Tinaviti said. "Farming has boosted our efforts and we are determined to continue farming and developing our village." The Navunisole Dalo Co-operative is setting sights on exporting in the next three years. For Mr Tinaviti, it is a dream come true - for someone who did not top his class. Elia is certainly feeling on top of the world with his achievements. For this they have received expert advice by agriculture officials in Tailevu. The long term objective of ROI is to enhance the livelihoods of rural people and islanders. Its immediate purpose is to increase market access opportunities and services. Mr Waqabaca said: " It is an experience for me as they have been planting for years now and it is what they are gifted with, so to be working alongside them is an honour." "It is indeed wealth from the land and I hope the younger generation will see for themselves the benefits of using the land wisely as a source of income." The members are still doing what they love best and that is farming to help them break out of the grips of poverty and create better lives for their loved ones.